I was going to do my own analysis of the militia takeover of Malheur Wildlife Refuge in eastern Oregon, but it turns out there’s no need: Lots and lots of insightful articles are out there already, so I’ve decided to survey them for you. the day-to-day actions of the occupiers and the (so far) apparent inaction of the government in response. The best place to keep track of this is through Oregon Public Broadcasting, which has a web page collecting all its Malheur-related articles. the legal case that sparked the occupation, the arson conviction of Dwight and Steven Hammond. the larger land-use issues that unite many local ranchers against government policy, whether they agree with the armed occupation or not. the off-beat and sometimes downright nutty versions of American history and constitutional law that the militiamen use to justify their actions. the hilarious responses of various comedians and satirists. Recent developments. As I said above, OPB is the place to keep up. If you’re waiting for a pitched battle, not much has been happening. The occupiers were supposed to be announcing their exit strategy Friday, but OPB didn’t publish one, so probably that didn’t happen. The most ridiculous recent story was the first arrest: Kenneth Mendenbach was arrested Friday for unauthorized use of a vehicle after he drove a commandeered government van into town for supplies. An unofficial spokesman for the militia called this a “dumb choice“. The Hammonds. The spark the set off the conflict was the re-imprisonment of the Hammonds, when an appellate judge ruled that their conviction (for arson on public land) carried a mandatory minimum sentence of five years. A good summary of the case comes from the local U.S. attorney. I agree that mandatory minimums are bad law, but I don’t believe in a special exception for white land-owners. So if this case motivates conservatives to get on board with criminal justice reform, that would be great. But a lot of non-violent black offenders are serving long sentences for drug convictions, and their plight doesn’t raise similar public compassion. BTW, the Hammonds quite likely have committed many more crimes than the arsons they were convicted of. They had already plea-bargained the charges down, and the government believes one fire was set to cover up evidence of an illegal deer hunt. There’s also a child-abuse angle on the story. So, in short, I don’t see them as sympathetic figures. 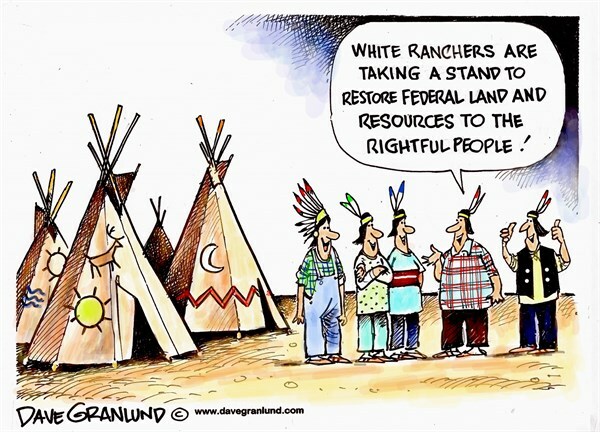 Ranchers and public land. A more positive view of ranchers and the complexity of the grazing-on-public-land issue comes from Grist‘s Nathaniel Johnson. Long-term grazing rights are not property, but in some ways they sort of are. For example, a bank will give you a loan based on the value of your grazing rights. Ranchers pay higher prices for land with federal grazing rights attached, so it’s not entirely crazy for them to feel cheated if those rights are changed or eliminated. Also at Grist, Darby Minow Smith, interviews her Montana-rancher Dad about the issues raised by the Malheur occupation. He argues that grazing on public land is a good thing, as long as it’s not over-done. There are indicator species that show that a forest is healthy. I’ve long maintained that cows on grazing permits are an indicator that there’s a system that’s working. There’s open space out there. There aren’t subdivisions choking up around the forest. On the other hand, The Week‘s Ryan Cooper calls attention to the underlying contradictions of “cowboy socialism”, i.e., the strange marriage of the rugged individualist stereotype to demands for free stuff (land, water, etc.) from the government. As Marc Reisner details in his history Cadillac Desert, this is the basic problem with Western politics, even up to the present day. It has been from the very start handicapped by the reality that only extensive federal government projects could possibly facilitate the settlement and development of the region, but it has been too wedded to the cowboy mythology to admit it. But instead of coming to terms with reality, and building quality government institutions to ensure the programs functioned properly, Western politicians simply grafted massive federal subsides onto their beloved cowboy individualism. If the federal government hadn’t fought the Indian wars and the Mexican-American War, the West wouldn’t be available to English-speaking settlers at all. Without expensive federal investments in dams and other big infrastructure projects, most of the non-coastal West would only support populations about the size of the Native American tribes who preceded the white settlers. Without the subsidies that created the transcontinental railroads, Western ranchers would have had no way to bring a product to market. And so on. OPB makes the connection between the proposal to return federal lands to the states and the probable result: privatization with no regard for hard-to-monetize values like the environment. Oregon is currently trying to sell the Elliott State Forest. Legal and historical nonsense. Pacific Standard‘s Aaron Brady attributes the claims of “federal tyranny” in Harney County to “Libertarian Fairy Tales“. In the beginning, there was the land. But like all virgin soil, it required entrepreneurial ranchers to settle it before it could produce value, and this was central to the myth: that nothing existed before the arrival of these free men. 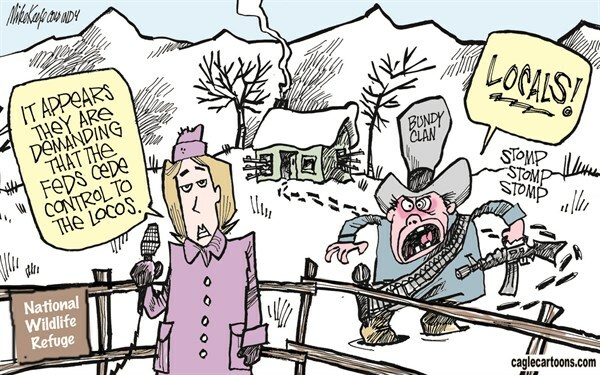 … For the Bundys, then, nothing really happened before the 1870s. They do not mention Spanish explorers in 1532, or French Canadian trappers, or the British occupation after the war of 1812, or Oregon statehood in the 1850s. Their story most definitely does not begin thousands of years ago, when the first people settled the region. They have no time for how the Army re-settled the northern Paiute in the Malheur Indian reservation in 1872—emptying Harney County for settlement by white people—nor how those same white settlers demanded (and got) the reservation dis-established in 1879 so they could have that land too. And then there’s the simple craziness of the occupiers’ legal/political views. Right Wing Watch‘s Miranda Blue gives some of the background, relying on Daniel Levitas’ 2002 book The Terrorist Next Door. Levitas traces the militia ideology back to the teachings of white supremacist minister William Gale: The Constitution gives the federal government no power to manage lands inside the sovereign states. (To believe this, you have to ignore or rationalize your way around Article IV, Section 3: “The Congress shall have Power to dispose of and make all needful Rules and Regulations respecting the Territory or other Property belonging to the United States”) And since the states have not stood against this federal usurpation, power reverts to the counties. The county should be recognized as the seat of power for the people, and the sheriff is to be the “ONLY LEGAL LAW ENFORCEMENT OFFICER IN THE UNITED STATES OF AMERICA!” all healthy men between the ages of eighteen and forty-five who are not in the military could be mobilized into a posse comitatus to redress their grievances, Gale explained. But of course, since the Harney County officials aren’t backing the occupiers, they’re not legitimate either. A “citizens grand jury” is being put together to press charges. The logic is circular: The occupiers will submit to legitimate authority, but any authority who tells them to stop what they’re doing is not legitimate. Religion. The Bundys are Mormons, and many of the militiamen seem to have a strange interpretation of Mormonism. I know virtually nothing about Mormonism, mainstream or otherwise, so I’ll let OPB’s John Selpulvado explain. Humor. The occupation has been fertile ground for comedy. Perhaps my favorite is this Ken-Burns-like documentary clip. Precedents and federal response. The government’s wait-and-see approach to the Malheur occupation contrasts sharply with the many shootings of unarmed blacks that Black Lives Matter has called attention to, and also to the violent ejections of Occupy Wall Street protesters from numerous encampments a few years ago. the MOVE bombing in Philadelphia in 1985, in which a militant black group was bombed by the police, killing 11 and setting 63 neighboring homes on fire. the attempted occupation of a federal wildlife refuge in Georgia in 1979, by 40 descendants of black slaves and sharecroppers who had once worked the land. Those who refused to leave were forcibly removed within three days and charged with trespassing. Those who sympathize with the militiamen talk about Waco and Ruby Ridge, two sieges that ended in bloodshed, and were cited as motivation for the Oklahoma City bombing a few years later. Even if you don’t sympathize, that history provides an argument for under-reacting to the current incident: Why incite bloodshed that could inspire further bloodshed down the line? And of course there’s the Bundy stand-off of 2014, in which a similar gathering of armed militiamen kept the Bureau of Land Management from recovering unpaid grazing fees by impounding the cattle of Nevada rancher Cliven Bundy, father of Ammon Bundy, a leader of the Malheur occupation. Numerous crimes were committed in the course of the stand-off (it being illegal to threaten a federal agent by pointing a weapon at him or her), but so far none have been prosecuted. The militiamen regard the 2014 incident as a victory, and seem to feel that Malheur continues their momentum. It’s not much of a stretch to believe that this incident arises from the lack of a forceful government response in Nevada. What I hope for. The government has a narrow path to walk. I understand the desire not to fight a pitched battle and then wait for reprisals from the militia movement. On the other hand, if Bundy and his compatriots come out of Malheur feeling victorious, they’ll go on to try something else. There’s debate about whether it’s appropriate to use the word terrorist here, but some of the same logic applies: If a group is looking for a confrontation, it’s very hard not to give them one eventually. If the U.S. government is not willing to enforce its laws against armed right-wingers, it starts to look a little like the Weimar Republic: Hitler was arrested for treason after his first attempt to take power, the Beer Hall Putsch of 1923. But he served less than a year in prison and was back out leading his party by the end of 1924. A German government that believed in itself enough to seriously punish insurrectionists might have saved the world a lot of trouble. So I think it’s important that the outcome of this incident, however long it takes, not give the occupiers anything they can describe as victory. There should be no concessions about the Hammonds or local land use, and the militia leaders have to go jail. Just peaceably going home — or off to the next confrontation — is not enough. I hope someone in the government is giving serious thought to how to make that happen without killing anybody. That will be a hard feat to pull off. I can see why the authorities don’t want to mount an armed response, but I can’t figure out why the occupiers aren’t arrested when they venture into town to buy snacks or sleep in a motel. The one guy arrested for taking a government vehicle is not enough. If they had to stay on site with only the provisions they brought with them, they would have to give up and turn themselves in before too long. I’m mystified too, but I can’t believe they haven’t thought of this. I’m still hoping they have a strategy. In short, rights begin with me. Why can’t the government just lay siege to the occupiers. Cut off power and water. No one goes in or back in. Let them get thirsty, hungry and have to dig a latrine. no one has discussed the possibility that the militias have protectors up the food chain either in the state legislature or in congress or in government bureaucracy and they are interfering with the enforcement of the law. If that’s true, we’re in more serious trouble than I thought. Protection from inside the establishment is a key part of the rise-of-fascism story in both Italy and Germany. But if the protection were really overt, I think we’d start hearing from some whistle-blowers. So for now, I’m sticking with my belief that it’s not happening that way.